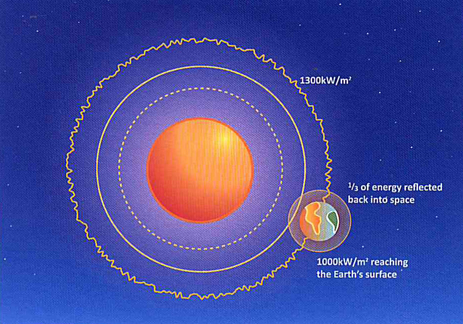 Our sun pumps about 386 billion million gigawatts into space, mostly in the form of electromagnetic radiation. By comparison, a large nuclear reactor generates about 1 gigawatt and global energy consumption is a few thousand gigawatts. Only a minuscule portion of the sun’s energy falls on our earth, yet this energy is responsible for running almost every living thing on the planet. To put this into context, every second the sun produces the same energy as about a trillion 1 megaton bombs! In one second, our sun produces enough energy for almost 500,000 years of our current needs of our so-called civilization. If only, we could collect it all and use it. The energy from just 20 days of sunshine is equivalent to all the energy stored in the earth’s reserves of coal, oil and natural gas. Every second, the outer layer of the earth’s atmosphere receives radiant solar energy of about 1300 watts per square metre. About one third of this light is reflected back into space, and the atmosphere absorbs a portion of this. By the time it reaches the earth’s surface, the solar radiation has fallen to about 1000 watts per square meter, at noon, on a cloudless day. Averaged over the entire surface of the planet, each square metre collects approximately 4.2 kilowatt-hours of energy every day.